Can be designed to lift almost any Bag / Sack / Suitcase / Rucksack. Driven by clean dry compressed air 6 bar or electric vacuum pump. Unique dual balance objects appear “weightless”. Mounted on aluminium jib arms or gantry systems. 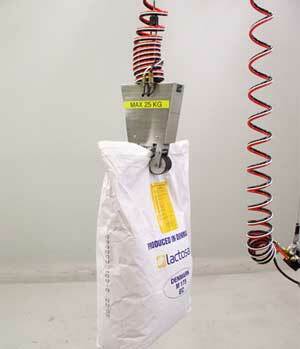 Capacities from 5 kg up to 100Kg. For use with mechanical or vacuum gripping tools.